Since returning from his illness, Roman Reigns has had one match, a 6-man tag team match at Fastlane, where The Shield wrestled together for one last time. Reigns was set to feature in his first singles match last week on WWE RAW, but an assault by Drew McIntyre scuppered that match, which resulted in him not featuring on this week's RAW. Reigns returned to the WWE in February after taking a few months to battle leukemia. The Big Dog was successful in his battle with leukemia and wrestled his first match earlier this month at Fastlane, where The Shield were victorious against the team of Baron Corbin, Bobby Lashley, and Drew McIntyre. 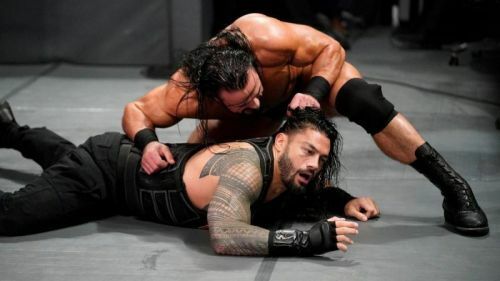 Before his singles match against Baron Corbin on RAW last week, Reigns was attacked by Drew McIntyre which meant that Reigns wasn't fit for his match against Corbin. Reigns didn't feature on this week's RAW, as he was recuperating from the vicious attack inflicted upon him by McIntyre. But the former Universal champion is set to return to action on next week's RAW, which is the penultimate RAW before WrestleMania 35. Also Read: WWE Rumors: Roman Reigns and Seth Rollins' Extreme Rules opponents leaked? Reigns is advertised to appear on RAW, as is Dean Ambrose, who was brutalized by McIntyre in a singles match on RAW last week. Ambrose also did not appear on RAW but did come to the aid of his Shield-brother, Seth Rollins, after RAW, this past week. WWE is also advertising a match between Braun Strowman and Baron Corbin, as well as a triple threat match between Finn Balor, Bobby Lashley, and Drew McIntyre, but WrestlingInc reports that these two matches will mostly be dark matches which will take place after or before RAW. Next week's RAW comes to us from Boston's TD Garden. WWE Rumors: Roman Reigns unexpectedly removed from next week's WWE RAW?